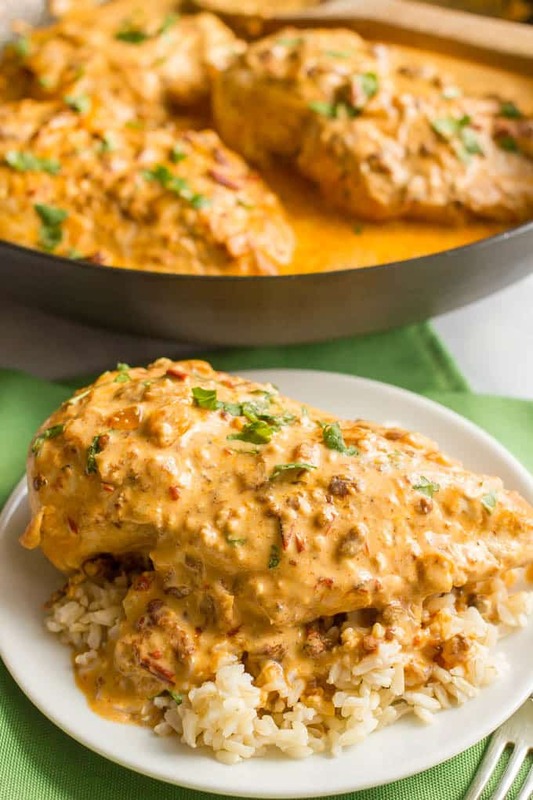 Creamy chipotle chicken is a simple but super flavorful 30-minute dinner with a delicious smoky chipotle cream sauce – that’s healthy! Serve over rice to soak up the extra sauce! You know, long afternoons at the pool or playground, lazy weekend mornings in our PJs in the backyard, evenings looking for fireflies and sipping on something delicious. This recipe is based on my chicken breasts with jalapeño cheese sauce recipe – it’s the same technique, just a slightly different flavor in the sauce. Can you tell I like some spicy and some smoky flavors?! 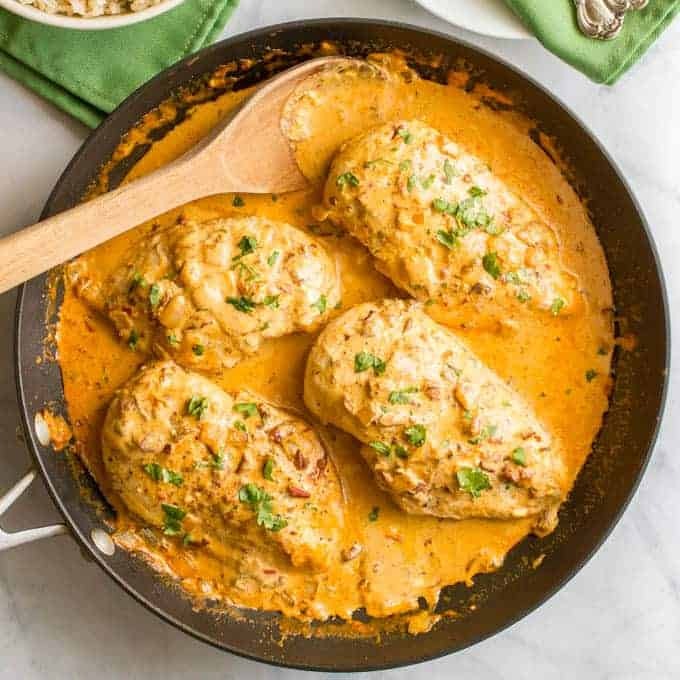 This creamy chipotle chicken – which doesn’t use any cream, by the way – is saucy and smoky and rich and all kinds of spoon-licking good! You sear the chicken in the pan and then remove it to make the sauce. The chicken will be returned to the pan to cook the rest of the way through. To make things efficient, you can chop your onion, garlic and chipotle peppers while the chicken is searing. I use 1/3 less fat plain cream cheese here. Full fat would work fine, too. You could substitute fat-free cream cheese if that’s what you prefer, but it’ll lose a little richness. 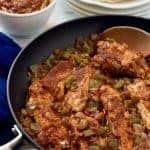 I use 3 chipotle peppers and 1 tablespoon of the adobo sauce in this recipe. You can increase or decrease that to your liking. We love serving this over steamed brown rice with plenty of extra sauce! You could also try it over quinoa, pasta or mashed potatoes. 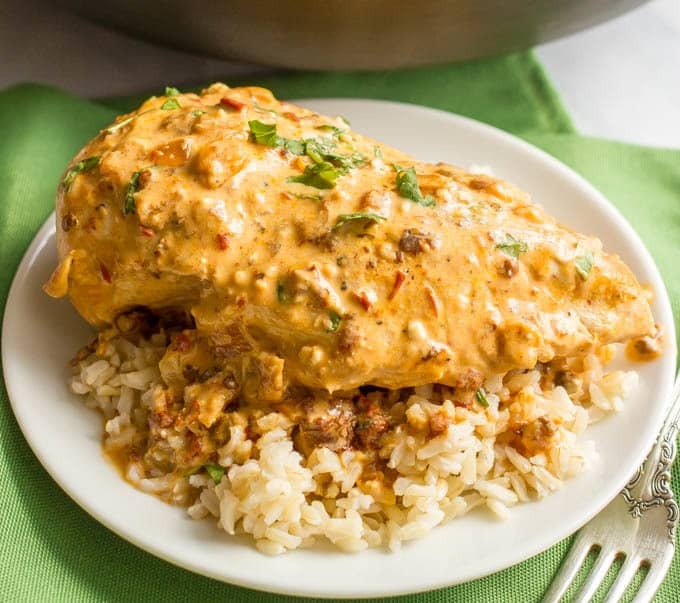 Flavor up your next chicken dinner with this easy creamy chipotle chicken! 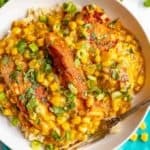 Some other comforting chicken dishes I plan to try soon: this creamy, garlicky mushroom chicken and this 20-minute cheesy chicken enchilada soup! Oh, and as for sides, we love chicken and brown rice alongside steamed lemon butter asparagus or maybe some steamed or roasted broccoli or broccolini. Hope you give it a try and hope you get to enjoy some slower days this summer! 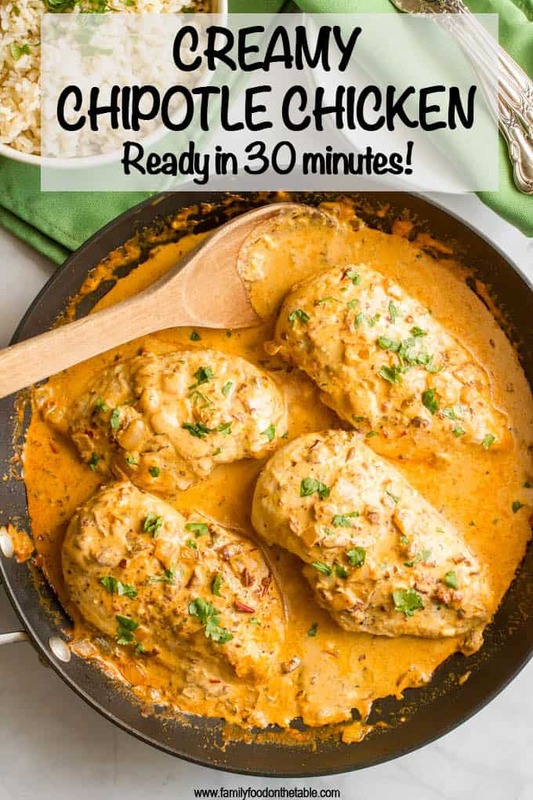 Creamy chipotle chicken is a simple but super flavorful 30-minute dinner with a delicious smoky chipotle cream sauce - that’s healthy! Heat 2 teaspoons of the olive oil in a large skillet over medium-high heat. 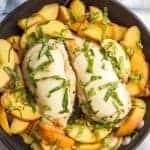 Season chicken breasts with the salt and pepper. Add to pan and sear for 4 minutes on each side, until golden brown. Reduce heat to medium and add remaining two teaspoons olive oil to pan. Add diced onion and cook, stirring occasionally, for 4-5 minutes, until softened. Add garlic and chipotle peppers and saute for 30 more seconds. Add adobo sauce, chicken broth and cream cheese and stir until melted. 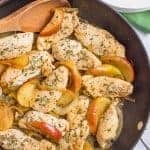 Return the chicken breasts to the skillet, along with any accumulated juices, and turn to coat in the sauce. Cover the pan, reduce the heat to medium-low and cook for 7-9 minutes, until chicken is cooked through. (It will depend on how thick your chicken breasts are.) 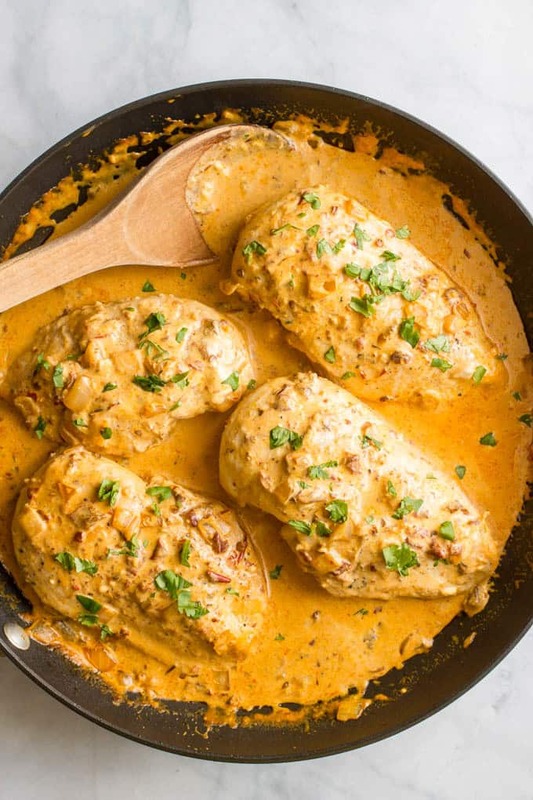 I like to spoon some of the sauce over the chicken breasts halfway through the cooking time. Once chicken is cooked through, turn off heat and stir in Greek yogurt. Season to taste with salt and pepper. 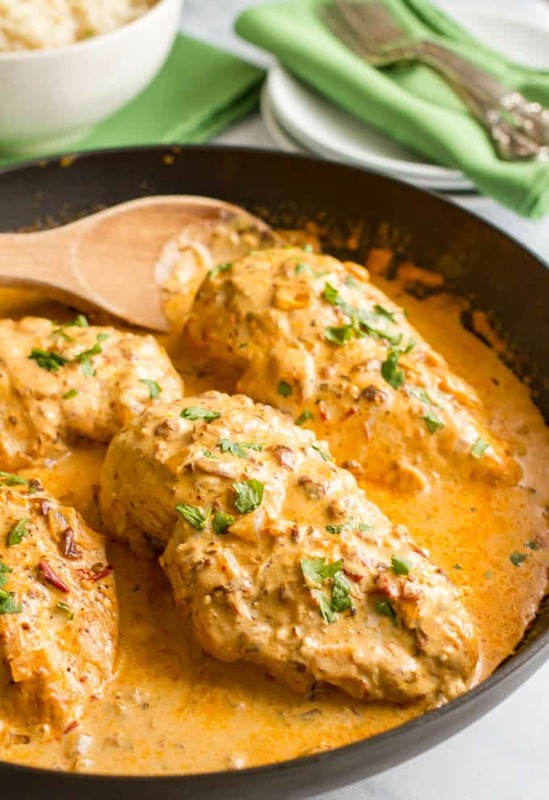 Serve chicken breasts with extra sauce spooned over the top, and enjoy! I use 1/3 less fat cream cheese here. Full fat would work fine, too. You could substitute fat-free cream cheese if that’s what you prefer, but it’ll lose a little richness. My mouth is watering! Love the idea of using cream cheese in the sauce. So delicious! It’s so easy and decadent but so much lighter! I’m with you Kathryn! I love spicy and smoky flavours too. I wish it was summer here in New Zealand but unfortunately it’s the middle of winter (want to swap? ), but I think your dish would be the perfect winter warmer too. I’m making it this week. Yum! Absolutely, this dinner works any time of year! I love that smoky chipotle flavor in dinner! A quick and easy recipe that’ll be ready in 30 minutes? Sign me up! Right?! I’m all about quick and easy! Really easy to cook. Amazing & Delicious! I’m so happy to hear you enjoyed it! Thanks so much for sharing! This was absolutely delicious!!! My husband devoured it, asking for more! We served it over saffron rice, and I also added some fresh summer squash to the dish when cooking the onions. Love it! I’m so happy to hear that Karissa! Thanks so much for sharing! This entire recipe just comes together so well. Thank you for sharing it! That sauce is the best! What is adobo sauce? Thank you! Hi Beverly! It’s the sauce that the chipotle peppers come in. I buy a small can and it’s called “chipotle peppers in adobo sauce.” Goya and Embasa are the brands they have in my grocery store and they’re near all the taco stuff in the international aisle for me. I hope that helps!